The grim reality of the maquiladora workers  has long been known. • Human rights of workers are frequently not respected. Going to the bathroom and drinking water are not permitted to most workers in order to speed production. • Labor rights are not respected. The Mexican labor laws are rarely followed. • The health and safety of the workers is at high risk. Unsafe working conditions often result in labour accidents. Exposure to toxic chemicals often causes industrial diseases. • Environmental laws are frequently not respected. The factories pollute the air, water and land. • The wages are not enough to meet the most basic needs of families. Living in a shanty house and hunger are the reality of workers’ children. Just one aspect of the grim condition of the Mexican proletariat in general, where some 40% of the workforce combine unemployment and subemployment, and competition for jobs is intense. But even so, in these awful conditions, the proletariat has been able to put up a fight. The strikers are now demanding 20% above the new minimum wage of 176 pesos daily, approx. $8,(this is the frontier zone rate, higher than the rest of the country, however the cost of living is much higher) plus a bonus of 32,000 pesos. The original demand was for a 100% wage rise. This was provoked by the new MORENA  President Andrés Manuel Lopez Obrador (AMLO) who came to power promising the transformation of Mexico. But of course, there can never be a fair wage, never be a fair rate of exploitation and the strikers seized the moment to go one step beyond. According to the same source, only 20.5% of the country’s population fall in the category of not poor and not vulnerable. This is very much a live situation but at the time of writing, 4 of the 45 businesses affected by the strike have agreed to the demands. Two have shut down their operations, claiming the demands are impossible. There are also reports of state forces protecting union leaders and tearing down red and black strike banners from factory gates, instructed by the AMLO administration to end the dispute. But the strike continues. A strike of any description in itself is an event in a country where extremes of poverty and inequality have only intensified due to a proletariat under the deadly tyranny of unions which illustrate perfectly the communist position on these thoroughly bourgeois organs as statist organs of preservation of bourgeois class rule, not organs of proletarian defence. This strike of necessity began as a wildcat. On 12th of January 2019 workers at Autoliv realised that management and union, the hated Union of Laborers and Industrial Workers of the Maquiladora Industry (SJOIIM) headed by Juan Villafuerte, who is over and over regarded as a particularly odious Judas on the strikers’ Facebook pages, were conspiring to rob them of bonus payments to claw back the wage increases already announced. This was particularly bad for the Matamoros workers as they were already receiving the new rate (due to the high cost of living in the area) and were now facing loss of other benefits. They reacted by setting up an independent strike committee. 2000 workers gathered in a general assembly and elected the committee, then they went to other factories and called out workers there hanging the traditional red and black factory closures flags on the gates. The maquiladora industry of the city of Matamoros was shut down. Thus, caught off guard, the union quickly moved to regain its lost control. On Friday 25th January at 2pm it was declared a legal strike. Rather than the initial 100% pay rise demanded by the strikers, the SJOIIM agreed to “fight” for 20% and a bonus of 32,000 pesos. Another key demand of the self-organised strikers, an end to the extortionate 4% of salary union dues also seems to have disappeared for the time being. However, the union has only gone on to reveal itself for the bosses’ stooge it always was and has been attempting to close down the strike, open the factory gates and essentially betray the strikers. The labour lawyer Susana Prieto has thus far been able to play an important role in preventing the return to self-organisation and a deepening of the dispute. She has presented herself as the champion of the strikers and dedicated to their cause, but in reality, she has been careful to prevent the rupture with the official structures which would risk a widening class confrontation. Prieto, a MORENA activist has convinced strikers to follow the channels of applying pressure to the union and appeals to AMLO. However, if the confused situation of the present clarifies, if it becomes evident that AMLO is indeed calling for the closing down of the strike, that the strikers have been sold down the river by the currently popular Susana Prieto and that their hopes have been quashed, then there still remains the chance that the strike will revert to the methods of self-organisation, will call into question the social realities of the working class and serve as a detonator for a wider struggle. For now, this remains to be seen. Internationalist Greetings from the Internationalist Communist Tendency. "To put forward revolutionary demands on the ground, however small, in the current insecure and feeble conditions of workers' struggle, to engage in an active political militancy not just restricted to a typewriter and theorising which is an individual activity that is always debatable in intention as well as results." (O. Damen) Battaglia Comunista n.11, 1958. Maquiladoras are factories and assembly centres of foreign companies operating in Mexico under the Mexico/US agreement called: “Maquiladora Program.” Most maquiladoras are US companies, but corporations form Europe, Japan, South Korea, and even sweatshop China operate maquiladoras. The National Regeneration Movement (Spanish: Movimiento Regeneración Nacional), also known by its acronym MORENA (Spanish for "dark-skinned"). For the 2018 general elections, it formed the coalition Juntos Haremos Historia (Together we'll make history) along with the left-wing Labor Party and right-wing Social Encounter Party. It won the presidency with 53% of the popular vote, and won a majority in both the Senate and Chamber of Deputies. Onorato Damen was a key figure in the Communist Left that defended revolutionary Communism against the degeneration of the Comintern from the early 1920s. He helped plan the formation in 1943 of the Internationalist Communist Party. In the seventies the Internationalist Communist Party around Prometeo and Battaglia Comunista organised the first of the International Conferences of the Communist Left. Out of these conferences the Internationalist Communist Party and the Communist Workers' Organisation together formed the International Bureau for the Revolutionary Party around the basis of a common platform. In recognition of the adherence of new forces the IBRP was later named the Internationalist Communist Tendency. Onorato Damen died in 1979 aged 85. The latest news I am hearing is that the number of companies accepting the demands is in the teens. However there are also reports of closures and firing. Meanwhile the municipal authority of Matamoros is intending to put up the fees for water supplies 30%. There is no real victory under capitalism, certainly nothing lasting, but as the CWO often says, the real victory is in the experience, the lessons, the class consciousness. This is just one significant episode in a global struggle which is being imposed by capitalism in its drive to maintain profitability. A Mexican comrade sent us the following personal comment on the strikes which we have translated to share with readers. 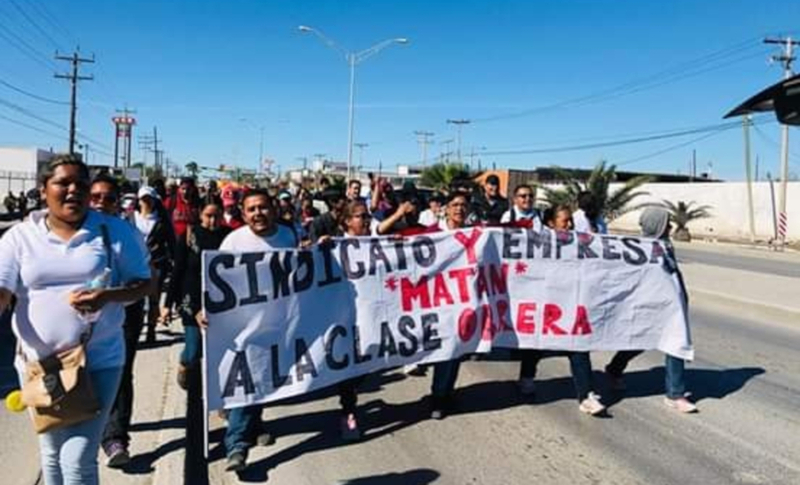 The Matamoros - Tamaulipas maquiladoras sector strike does not seem to me to be an isolated situation in relation to the movement of the 33,000 public sector education workers in Los Angeles in the United States. The latter have not struggled in a coordinated and simultaneous way, These workers are said to have not mobilized in struggle for more than 30 years. But after 21 weeks of negotiations without reaching an agreement, they went on strike, and then, ... They won a victory. Well, it is said that not only did they get the requested salary increase, but they also achieved their other demands, such as a larger investment in the public education system, including more staff. support and downsizing in classrooms. Now the authorities and the union can say what they want! The most important point about this movement is that it did not occur in a peripheral country of the American continent, but in the leading power of the continent. The movement for wage increases and other social benefits has grown, which is a sign that the economy of this "continental" power is in crisis and that there is deep discontent within the working class. The education workers have given us the best example of this. About the Maquiladoras of Matamoros - Tamaulipas. Attacks on the living conditions of the proletarian class are already beginning to be felt and this was the first to reveal the deception of the new leftist government led by Andrés Manuel López Obrador. He promised to issue a decree in which he declared that all workers in the border strip with the United States from 1st January, would get double wages, so they would rise from 88.36 pesos to 176.72. But the decree only existed in the newspaper as pure propaganda from the president. The main attack, the most irritating, consists in the fact that this propaganda claims that the workers will double their earnings but not all will. Only those who earn a minimum wage will. For those who earn more than the minimum, or 88.36 pesos, any wage increase is dependent on each company's criteria for increases. And even worse, employers took advantage of this not only to not increase the wages of workers, but to remove the other benefits they had already gained in previous years. This attack, planned very methodically by the current left-wing government, pushed the Maquiladora workers to go on strike demanding a 20% wage increase request, a 32,000 pesos bonus per year and a 4% reduction in their union dues. It should be noted that since the beginning of the strike, workers have been attacked from all sides. On the one hand, the unions of both the casual laborers and permanent workers in the Maquiladoras industry (SJO and MM) did not allow workers to strike because they wanted to, but because it was overwhelmed by the discontent of the workers. The most important action of the Maquiladora workers is that they went on strike simultaneously; four directorates of the 45 factories decided to accept the demands of the workers. Only 41 factories declared for a strike, but the workers' mistake was not to put pressure on all employers at the same time. So that on January 28, 20 of the 41 factories that had already accepted the demands of the workers, lifted the strike in a staggered manner and no longer exerted a strong pressure on all the employers, these 20 factories returned to work and thus isolated the rest of the strikers. This has benefited the employers and the government of the State which through the Conciliation and Arbitration Commission has declared the strikes in 13 of the 29 plants that are still out illegal. Once this happened, the government gave workers 24 hours to take down their strike banners and return to work. They threatened to have them deported by the police if they did not do so. But despite the threats of this employers' government, the workers are continuing their struggle, the only alternative left to them now is to use their massive force, which represents about 18,000 strikers. In addition, entrepreneurs, through Luis Aguirre Lang, of the Maquiladoras National Export Industry Council (index), said it was cheaper for them to sack workers and go to another state or leave the country than to comply with the demands of the workers. He also stated that he did not rule out the possibility that the demands for wage increases in the Matamoros factories would extend to subcontracting firms located in other cities on the northern border. This is what worries the bourgeoisie the most. Whatever happens to the strikers who are still on strike, this movement has shown that the bourgeoisie is only used to getting rich, to exploit the workers more. But when the working class wakes up and regains its class identity and decides to return to the class struggle, the bourgeoisie is terrified by the furious cries of their discontent. It is heartening to note that workers in 24 of the 45 striking factories obtained a 20 per cent wage increase plus the 32,500 pesos bonus, as well as the triumph of the Los Angeles education workers' strike in the United States. They also provide an excellent education for the working class as a whole, in the United States, as well as in Mexico and other countries of the continent. Another company Soriana just came out and demands are for a 20% raise and end to union dues. More signs of a breakdown in the labour capital relationship.